50 Artists Who Inspired Kurt Cobain Cobain's record and T-shirt collections were a way to discover little-heard music in the '90s. 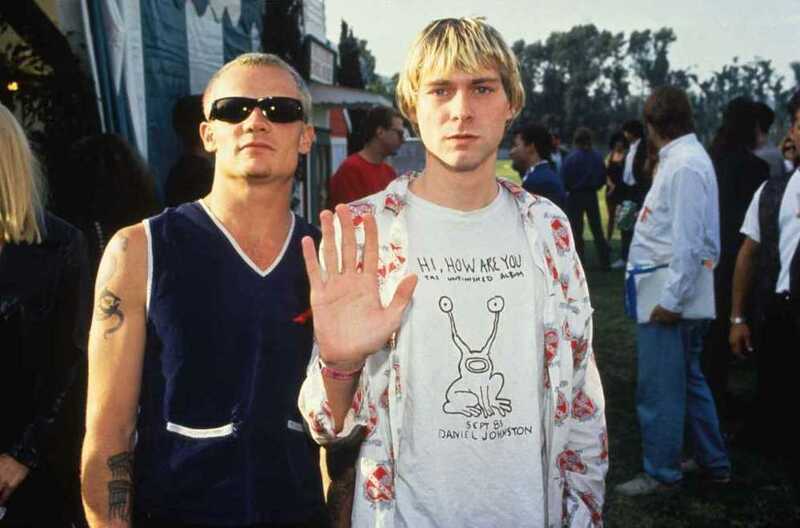 Nirvana's Kurt Cobain (right), pictured with Flea, wears a Daniel Johnston T-shirt at the 1992 MTV Video Music Awards. When was the last time a musician's tastes had a commanding presence in pop culture? Anybody can have that power with the advent of the Internet — not that there's anything wrong with being your own tastemaker — but in the early '90s, Kurt Cobain's record and T-shirt collection provided a great way to discover little-heard music that Top 40 radio and MTV ignored or downplayed. Nirvana's Nevermind came out 20 years ago this week, and we're celebrating by highlighting 50 artists who made an impact on Cobain. Now, inspiration is a three-headed puppy — a cute Cerberus, if you will. There are the childhood and teenage memories, like Cobain crying to Terry Jacks' hokey "Seasons in the Sun" as a child or engaging in that common musical rite of passage: hearing The Beatles for the first time. There are also the legit, wow-did-he-steal-that-riff influences like Killing Joke or Pixies. (The former sued Nirvana over "Come As You Are" — which definitely recalls "Eighties" — but the suit was dropped after Cobain committed suicide.) With Pixies, Cobain was more forthcoming in a 1994 Rolling Stone interview about "Smells Like Teen Spirit": "I was trying to write the ultimate pop song. I was basically trying to rip off the Pixies. I admit it." And then there are friends — the artists who knew Kurt Cobain before Nirvana was even a part of "the year punk broke." 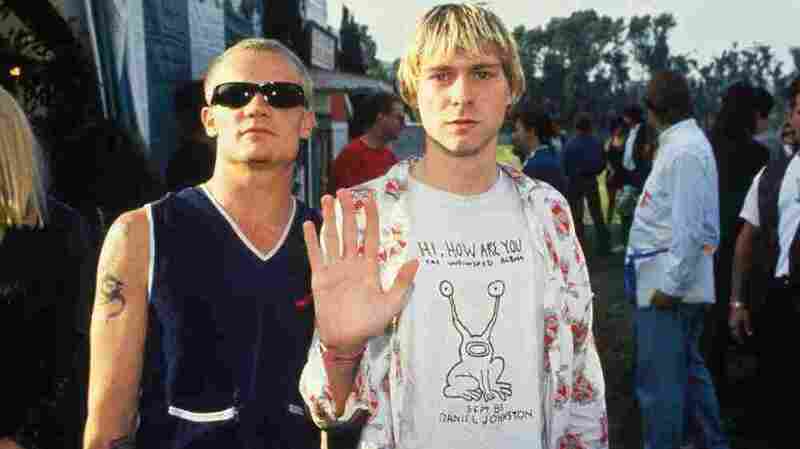 The members of Pacific Northwest bands like Bikini Kill, Beat Happening, Mudhoney, Melvins and Earth were personal and artistic lifelines to Cobain. (He even tried out for Melvins and appeared on an early Earth demo.) And then there are the contemporaries he met on the road, like Dinosaur Jr., Sonic Youth and R.E.M., whose Michael Stipe was set to collaborate with Cobain. Kurt Cobain was only too happy to spread the love through covers — original versions of those songs appear in this mix — and clever anecdotes about his own music. (The most colorful: "All in all, I think we sound like The Knack and The Bay City Rollers being molested by Black Flag and Black Sabbath.") His proselytizing resulted in everything from lo-fi oddball Daniel Johnston recording a polished yet underrated album, Fun, for a major label to plaid-clad slackers being royally confused by Half Japanese. These are only 50 of the many artists Cobain mentioned in interviews, asked to tour with, wore on T-shirts or wrote about in his personal journals, which have been published for the obsessively curious. Please share more of Kurt Cobain's influences in the comments section.